I'm not really beating myself up over it though. I've had a few people that are fellow bloggers gasping because I am fully open about it. It's nothing to be ashamed of, I don't feel like I've let anyone down & certainly don't feel like I'm setting a bad example. A bad example would be me being dishonest & pretending I'm still at my goal or pretending I'm perfect. 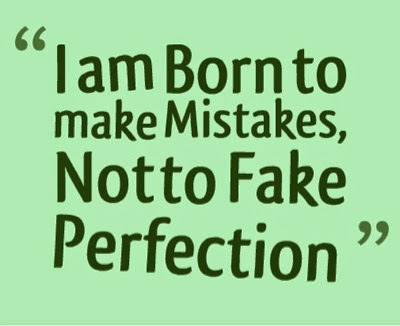 We as humans, are born to make mistakes. If we didn't we would never learn. I know I see faked perfection all over the place & it just leaves me shaking my head. There is absolutely nothing wrong with showing the struggle. Like now, I know what I need to do. I really do. The bad thing with helping people is that I read everything about health & fitness. Everything.....from the cheesy fitness magazines to case studies. It's pretty damn overwhelming. So if you've noticed me scaling back on my FB page on everything except positive quotes, it's for a reason. I must focus on myself more. I need to get back to basics. Tracking, eating generally healthy & moving my body. That has been what I've always done. So yeah....I'll keep airing my business on my blog & hopefully you'll take comfort in knowing that I'm human just like you and that despite the ups and downs you'll also know you can still do anything you set your mind to.